Color: Black or as your requirement. Triplex service drop cable & wire used to supply power, usually from a pole-mounted transformer, to the user’s service head where connection to the service entrance cable is made. To be used at voltages of 600 volts phase-to-phase or less and at conductor temperatures not to exceed 75°C for polyethylene insulated conductors or 90°C for crosslinked polyethylene (XLP) insulated conductors. Email: sales@huadongabccable.com. Please send us the specification, Our competitive price will send you in 12 hours. Hudong Cable Group is a manufacturer of triplex overhead wire from China. in producing triplex electrical wire, Huadong Cable Group insist on the ideal “quality first, customer first, safety first” . Better service and faster delivery is the pursuit of company. They are not only our hope, but also exist our electrical triplex production. If you choose Huadong Cable Group as your partner, Huadong will cherish with honesty and procession to get equal and mutual benefit. Don’t hesitate anymore, leave your message, we will get a mutual benefit situation. The most important is you can get the satisfied triplex conductor. Email: sales@huadongabccable.com. The conductors of triplex overhead wire are concentrically, compressed 1350-H19 aluminum. 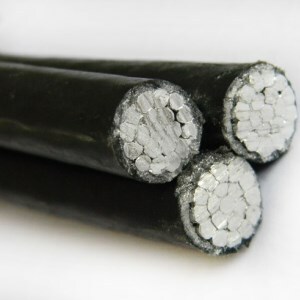 The insulated of triplex aerial cable is polyethylene (PE) or cross-linked polyethylene insulation (XLPE). In general, the color of insulated is black, but we can produce through your requirement. The neutral messengers of conductor triplex are concentrically stranded 6201, AAC, or ACSR. If you have any of your requirement, you can leave your message. We will reply within 24 hours. Email: sales@huadongabccable.com. How to choose good triplex abc cable? There are so many triplex overhead wire manufacturers, so we may be confused in the picking the triplex electrical wire. How to choose the good electrical triplex is very important. We have some tips. First step is looking. All products has their own Certificate of identification, so we need check it first. When we choose electrical triplex, we should check if it has “3C” certification mark. Whether the model specifications of the overhead triplex, rated voltage, length, date of manufacture, certification number of the triplex conductor, inspector, implement of standards, factory name, address and other identification are clear or not. Then the outlook of triplex aerial cable is also important. The outlook should be smooth round, uniform color and have no damage. Next is the package. The package should have clear conductor triplex information and company information. Expect these information. We should check if the length, the core wire and the conductor fits the standards. If you want to see these certification clearly, please leave your message, we will send you later. Email: sales@huadongabccable.com. Second step is to test the triplex abc cable. Getting a triplex overhead wire and bending it overtimes, if the triplex electrical wire is soft, flexibility and no cracks on the cable’s insulation, then it is a good electrical triplex. We should test its longitudinal tensile strength. Getting about 1m triplex conductor, and peeling aside core wire layer, insulated layer. Each side has 0.1m. When you hold the two neighboring sides and pull them to contrast direction. If you you can pull them out easily, the triplex aerial cable must have quality problem. Good conductor triplex can not be pulled out. Another way is to pinch the jacket of the triplex abc cable. If you fell it is loosing, it will be at bad quality. You can also weigh the triplex overhead wire. You can test the length of the cable, or its weight. Good triplex electrical wire is within the weight range. Email: sales@huadongabccable.com. The third step is comparing. Due to the low cost of making fake triplex conductor, their manufacturers sale the overhead triplex in a very low price. So you must be careful to buy the triplex conductor. The quality is the first. You can come and visit our factory and check the product, leave your message. We will contact with you as soon as possible. Welcome to visit our factory, leave your message, we will send the address you with 12 hours. Email: sales@huadongabccable.com. If you want learn more about huadong cable group factory information & cable price, please feel free leave the cable specification, our price list will send you in 12 hours. Email: sales@huadongabccable.com.